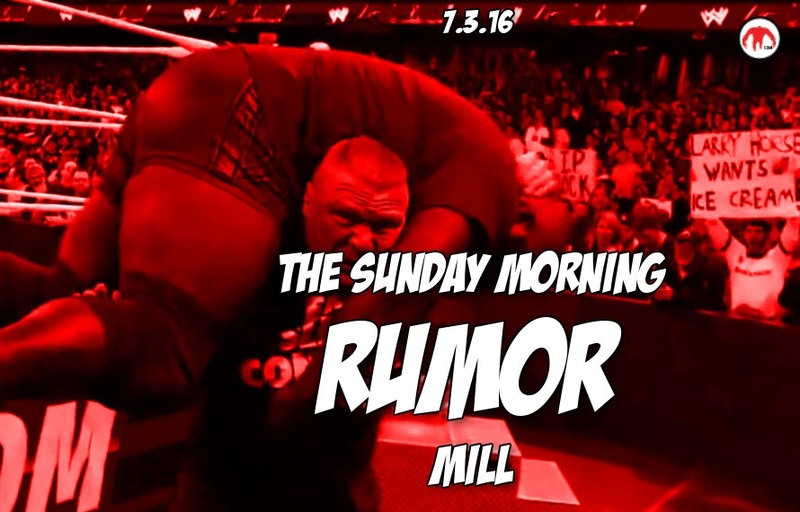 Welcome back Sunday Morning Rumor Mill…..we’ve missed you. Over the past several months a steady flow of MMA rumors have constantly passed between all of MiddleEasy’s satellite offices. With the UFC holding not one but three cards during their annual International Fight Week, the river of MMA rumors has been too great for us contain. The time is now to go big or go home to *insert latest UFC catchphrase here* with all these MMA rumors swirling around us. UFC 200 is less than a week away and maybe a new SMRM is better alternative to nibbling off your fingernails in anticipation. We must share. Sharing is caring and sharing rumors from the inner workings of the MMA industry is one level above caring. As always these our rumors that have been talked about behind closed doors between MMA higher ups, so take them as rumors. Plans are for Brock Lesnar to appear on WWE television for the Raw vs. Smackdown draft special on July 19. The Lesnar WWE TV return is still highly dependent on the outcome of his fight with Mark Hunt at UFC 200. A brutal loss by Brock could push his WWE return back a little further. Test your might. Ronda Rousey is rumored to be in talks of playing Sonya Blade in the new Mortal Kombat movie to be released in 2017!! Look out for other potential huge Rousey movie deals to be cut in the next few months. Old school Grand prixes make everything better. With the big RIZIN event coming in Sept. with the first portion of the Openweight Gran Prix, which will conclude in the annual NYE show, Sakakibara & Co. may be looking to get Benson Henderson and Rampage Jackson in on their Bellator talent pooling deal. With their broadcast partnership, ending in less than 24 months the UFC’s relationship with Fox has been a little more wavy in 2016. If they stay with Fox or go to another network, the UFC will be one of the few television sport’s properties up for bid in the next four years and the promotion anticipates a healthy bidding war for their MMA content between a number of sport’s networks. If you have heard of any interesting rumors that you’d like to add, feel free to post them in the comments section below, on our Facebook page, tweet us or mail them to us in an unmarked envelope. Just remember they are rumors and not confirmed as fact, so please take them as such.